Two photographs taken in 1917, by 16 year old Elsie Wright and her cousin 10 year old Frances Griffiths along with 3 others taken in 1920, were accepted by, Sherlock Holmes creator, Sir Arthur Conan Doyle as evidence for the existence of fairies. The cousins didn’t admit until 1983, that the fairies in the photographs were cardboard cut outs. Even then they still insisted that they had really seen fairies. And I am quite prepared to believe that they did indeed remember seeing fairies. I too have such a memory. When we were very young, my brother and I adored the teenage girl who child-minded us. Being with her could be enormous fun. Once when she was doing the dishes, she told us that the reason the washing up liquid was called Fairy, was because there were fairies in the bubbles. She then blew some bubbles for us. I have a distinct memory of having seen fairies, including one using a steering wheel to manoeuvre her bubble. Imagination is a wonderful thing. The upshot of this experience wasn’t that I ended up believing in fairies, but that at a very young age I learned that seeing is not sufficient reason for believing. From the age of eight until I was in my mid teens I was a voracious reader, reading everything that I could find, including a book of poems by the First World War army chaplain, preacher and poet, G.A. Studdert Kennedy. (1883 -1929). The following section from one of those poems left me absolutely bewildered. The symbols of a Truth. As far as I was concerned there were and never had been any fairies, and whether or not Jesus had ever lived had no bearing on the matter. To me then the clear sense of what he was arguing was that it didn’t matter whether or not Jesus had lived, and yet bewilderingly he was drawing the entirely opposite conclusion. As an adult I understand him to be arguing that living beliefs need to be based on truth, and I think that there is clear evidence that he is wrong. 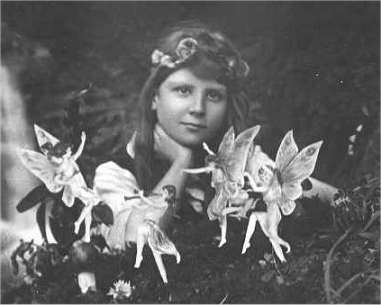 Beliefs require emotional resonance, and, as the story of Sir Arthur Conan Doyle and the Cottingley fairies shows, this can be achieved without that which is believed having any underlying substance. Aesop’s fables, such as Belling the Cat, and The Lion and the Mouse, demonstrate that truths can be told, by stories of things that never happened. So no, living fancies don’t need to be the symbols of a truth. But also just because something isn’t literally true, doesn’t give you any reason to believe that its message is false. Having said all that, I am going to argue that it is probable that Jesus of Nazareth was a real person. The Bible can be a very informative book; for instance it was reading Genesis 1and 2 that convinced me that Scientific Creationists were basing their faith on the literal truth of their interpretation of the Bible, not on what it actually said. It also tells me that the implicit claim made in this quote, taken from the introduction to my Gideon copy of the New Testament is false. Most of them (the human writers of the bible) had no contact with each other and no means of knowing that when their writings were all put together as one book it would be complete, all parts agreeing in doctrine, teaching and prophecy. Nor of course had they any way of knowing the truth, that their writings would be put together into a book, where the different parts did not agree in doctrine, teaching and prophecy. One of the discrepancies in the Old Testament was noted by the philosopher Bertrand Russell. The Bible says both that a woman must not marry her deceased husband’s brother, and that, in certain circumstances, she must do so. If you have the misfortune to be a childless widow with an unmarried brother-in-law, it is logically impossible for you to avoid disobeying ‘God’s law’. The New Testament despite the fact that it was written over a much shorter period of time is also loaded with incompatibilities.. In the following quote taken from The Sermon on the Mount, in Matthew’s Gospel, Jesus is portrayed as affirming his commitment to the Jewish Law, in fact telling his listeners that they must be even stricter in their adherence to the law, than the most strict Jewish adherent. Think not that I am come to destroy the law, or the prophets: I am not come to destroy, but to fulfil. For verily I say unto you, Till heaven and earth pass, one jot or one tittle shall in no wise pass from the law, till all be fulfilled.Whosoever therefore shall break one of these least commandments, and shall teach men so, he shall be called the least in the kingdom of heaven: but whosoever shall do and teach them, the same shall be called great in the kingdom of heaven. For I say unto you, That except your righteousness shall exceed the righteousness of the scribes and Pharisees, ye shall in no case enter into the kingdom of heaven. Yet in John’s Gospel Chapter 8 Jesus is portrayed as failing to follow the law himself, and also dissuading others from doing so. The Law was very clear on what should be done to those caught in adultery. That two different authors make apparently incompatible claims about Christ, while it is relevant to the claim of Biblical consistency, doesn’t tell us whether or not Jesus was a real person. What appears more relevant is that there are incidences in Matthew’s Gospel where Jesus is portrayed as condoning the breaking of Jewish Law. In Matthew Chapter 12 verses 1-8, Jesus disciples pluck ears of corn and eat them on the Sabbath day. When the Pharisees point out to Jesus that his disciples are breaking the Sabbath; rather than telling his disciples to desist, he says King David broke the law too, and the, “Son of Man is Lord of the Sabbath”. (The term Son of Man, in Hebrew Ben Adam, literally son of Adam, is found in what are regarded as Messianic texts in the Old Testament, it is also used as a synonym for any man/person, see Isaiah 56:2.) A slightly different version of this story appears in Mark’s gospel. There Jesus says, “The sabbath was made for man, and not man for the Sabbath”, Mark 2:27. The Jesus in Matthew’s sermon on the Mount , with his strict legalism, is very different from the Jesus described elsewhere in Matthew, where the behaviour described indicates that he understood the law to be flexible, there for the service of man, rather than the other way around. These discrepancies don’t prove there was a non-mythical Jesus. They may be nothing more than the consequences of taking the beliefs of two different early Christian sects and trying to form a coherent whole. We read elsewhere in the New Testament, notably in Galatians that there was a controversy in the early Christian Church, between those who thought that the new movement should follow the Jewish Law, and those like the writer of Galatians, a letter biblical scholars tell us might actually have been written by Paul, who held that Christians were no longer under the judgement of the Law. Galatians Chapter 5 Verses 13 and 14. The law is fulfilled by acting in love to yourself and to the other. So no the incompatibilities discussed here, don’t prove that Jesus was a real person, but they provide evidence supporting another claim of the New Testament. The claim that there was a faction within the early church who opposed the teaching that Christians were no longer subject to the law. The gospels are foundational documents, explaining the origins of Christianity. All of them claim that Jesus of Nazareth was the Messiah long expected by the Jews. All of them contain one detail that was absolutely not expected of the Jewish Messiah. He had been crucified. It is improbable that all four gospels would contain this claim, if it had not been an historical reality; therefore I conclude that there probably was a real Jesus of Nazareth who was crucified. Rational arguments do not have the power to impart emotional certainty. Stories do. And it was a moment of empathy with what I concluded, based on emotional resonance, to be the bewilderment of a First Century eye-witness;which convinced me that there had been an historical Jesus. That and the fact that the verses which inspired the reaction contained such a mixed message , that the only reason for including it just had to be the conviction of the collator of Matthew that it was an eye-witness report. Matthew Chapter 13 Verses 47-51. What I saw recorded with stunning simplicity at the end of this story was the utter bewilderment of an eye-witness, that those around her/him all claimed to understand what had been said. A bewilderment which at the time matched my own. Many evangelicals have predicted doom and gloom if the Supreme Court issues a ruling in favor of gay marriage. However, I predict the sun will come up the next day and after a lot of weeping, wailing and gnashing of teeth, not much will change. This usage makes sense. Wailing and gnashing of teeth is behaviour consistent with someone throwing a tantrum, and not as the hellologists of Christendom had and still have it, the reaction of people enduring the pain of eternal torture. It is an image of maximal greatness that doesn’t sit easily with our species’ respect for power. The sense that life is just and that people get what they deserve is a very common human belief, and not just of religious people. It can lead to a blame the victim mentality, and a belief that might is right. That people wouldn’t have all that power if they weren’t good. A belief in a God who is maximally powerful can provide the rationale, for this belief, and be used to shore up very unjust power based systems. It has taken considerable theological and philosophical ingenuity to mould the God of the New Testament, the God who became man, into a format that suited the complacent views of life’s privileged – the Omnipotence that Bertrand Russell identified, as one of the dogmas of traditional theology. It is this Omnipotence, and the belief that he was God, that G.A. Studdert Kennedy railed against in a poem of his, that has immense emotional resonance. Though a million angels hail Thee King of kings, yet cannot I. United Church of Canada Minister Gretta Vosper has recognised that belief in the Omnipotence, can result in evil. She argues that we must reject the god called God, because belief in him can motivate bad things. Studdert- Kennedy would have agreed, but he would have rejected the notion that the Omnipotence was the God that he called God. . Strikes with dumbness any preacher, brings him humbly to his knees. This is the saving myth of Christianity, bequeathed to us by the very human writers of the gospels. To recognise, “That than which no greater can be conceived to exist,” in the broken bleeding man on the cross, is to be saved from the dominant myth of this world, that might is right. This is the truth that our species shameful forelock tugging respect for power, and two millennia of theology have conspired to hide from us.